The AWS Trusted Advisor is a really cool but relatively little-known part of AWS. It inspects your AWS environment and makes recommendations to help you save money, improve performance, or close security gaps. Because the AWS Trusted Advisor draws upon the aggregated operational history of hundreds of thousands of AWS customers, you can be confident that the recommendations that it makes can help you to save money, bolster your security profile, improve the fault tolerance of your application, and increase overall performance. This is a unique and powerful benefit that is only possible with cloud-based, API-enabled infrastructure. To give you a better idea of the value of the recommendations, let’s focus on the last 90 days. During this time, AWS customers reviewed 135K AWS Trusted Advisor recommendations and took actions that resulted in an estimated $18M in annualized savings. The AWS Trusted Advisor is normally available to AWS customers who have signed up for the Business or Enterprise levels of AWS Premium Support. 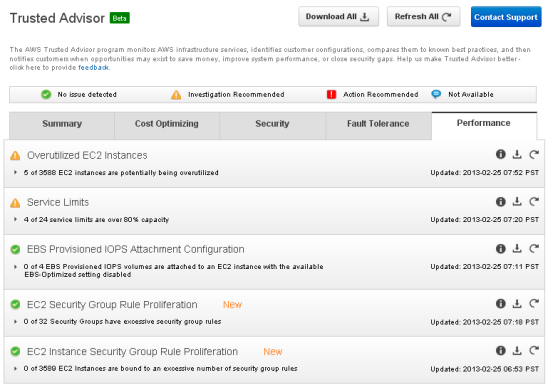 For the month of March 2013, the AWS Trusted Advisor is available to all AWS customers. You can now take advantage of 27 different checks conducted by the Advisor, regardless of your AWS support level. If you like what you see, you can sign up for AWS Premium Support and enjoy continued access to the AWS Trusted Advisor, along with many other benefits. To see what the AWS Trusted Advisor has in store for your AWS account, simply click here to get started. RDS Security Group Access Risk – This check examines RDS Security Group configurations and warns when a security group rule potentially grants overly permissive access to your database. 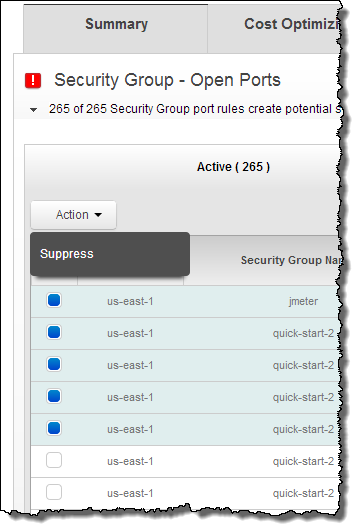 EC2 Security Group Rule Proliferation – This check examines the configuration of your EC2 Security Groups and flags Security Groups when they have potentially excessive rule quantities. EC2 Instance Security Group Rule Proliferation – This check examines the number of EC2 security group rules that are bound to individual EC2 instances, and flags the EC2 instance when it is bound by an excessive number of security group rules. Idle RDS Instances – This check examines your RDS DB instances and flags any MySQL or Oracle instances that appear to be idle. If an RDS DB instance has not had a connection for a prolonged period of time, there is a high likelihood that the instance is not actively being used. 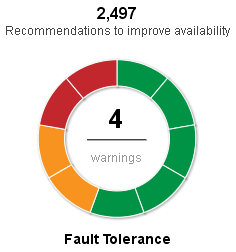 If that is the case, cost benefits can be realized by shutting down the instance. If persistent storage is needed for data on the instance, lower cost options to persist the data for later use exist such as taking a snapshot. 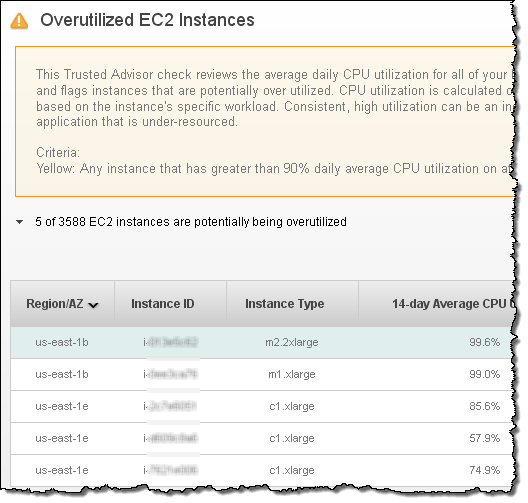 You have access to the AWS Trusted Advisor for the entire month of March. Give it a try and leave me some feedback to let me know how it worked out for you.